In the shown schematics, object B and one other object are interested in a certain Signal. B is a so-called Slot that can be announced to be interested in receiving a Signal (indicated by the circular connector to the dispatcher). Object A now sends the corresponding Signal. The Dispatcher takes care of realizing the dependency and informs the Slot B (and one other Slot) about the occurrence of the Signal. Those two conditions allow the asynchronous processing of Slots. That means: It is possible to determine, by configuration, that a Slot must not receive a Signal in the very same moment it occurs, but to receive it on a later point in time, maybe after other Signals from a queue have been processed or even on a completely different server. A Signal represents a specific event, e.g. that a content version has been published. It consists of information that is significant to the event, e.g. the content ID and version number. Therefore, a Signal is represented by an object of a class that is specific to the Signal and that extends from eZ\Publish\Core\SignalSlot\Signal. The full qualified name of the Signal class is used to uniquely identify the Signal. For example, the class eZ\Publish\Core\SignalSlot\Signal\ContentService\PublishVersionSignal identifies the example Signal. In order to work properly with asynchronous processing, Signals must not consist of any logic and must not contain complex data structures (such as further objects and resources). Instead, they must be exportable using the __set_state() method, so that it is possible to transfer a Signal to a different system. 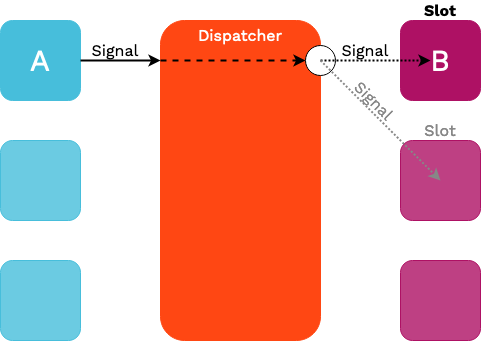 Signals can theoretically be sent by any object that gets hold of a SignalDispatcher (eZ\Publish\Core\SignalSlot\SignalDispatcher). However, at a first stage, Signals are only sent by special implementations of the Public API to indicate core events. These services must and will be used by default and will wrap the original service implementations. A Slot extends the system by realizing functionality that is executed when a certain Signal occurs. To implement a Slot, you must create a class that derives from eZ\Publish\Core\SignalSlot\Slot. The full qualified name of the Slot class is also used as the unique identifier of the Slot. The Slot base class requires you to implement the single method receive(). When your Slot is configured to listen to a certain Signal and this Signal occurs, the receive() method of your Slot is called. Inside the receive() method of your Slot you can basically realize any kind of logic. However, it is recommended that you only dispatch the action to be triggered to a dedicated object. This allows you to trigger the same action from within multiple Slots and to re-use the implementation from a completely different context. Important: A single Slot should not take care of processing more than one Signal. Instead, if you need to trigger same or similar actions as different Signals occur. You should encapsulate these actions into a dedicated class, of which your Slots receive an instance to trigger this action. There are of course additional Signals that trigger an update of URL aliases, but these are left out for simplicity here. See Listening to Core events recipe in the developer cookbook for more information. Template matching will NOT work if your content contains a Field Type that is not supported by the Repository. It can be the case when you are in the process of a migration from eZ Publish 4.x, where custom datatypes have been developed. In this case the Repository will throw an exception, which is caught in the ViewController, and if you are using LegacyBridge it will end up doing a fallback to legacy kernel. The list of Field Types supported out of the box is available here. When you interact with the Public API, and with the content repository in particular, Signals may be sent out, allowing you to react to actions triggered by the repository. Those signals can be received by dedicated services called Slots. This recipe will describe how to register a Slot for a dedicated Signal. As described above, a Slot is the eZ Platform equivalent of a Symfony event listener and must extend eZ\Publish\Core\SignalSlot\Slot. You now need to register OnPublishSlot as a service in the ServiceContainer and identify it as a valid Slot. Service tag ezpublish.api.slot identifies your service as a valid Slot. The signal part (mandatory) says that this Slot is listening to ContentService\PublishVersionSignal (shortcut for \eZ\Publish\Core\SignalSlot\Signal\ContentService\PublishVersionSignal). Internal signals emitted by Repository services are always relative to eZ\Publish\Core\SignalSlot\Signal namespace. You can register a Slot for any kind of signal by setting signal to * in the service tag. eZ Platform comes with a generic Slot that converts signals (including ones defined by user code) to regular event objects and exposes them via the EventDispatcher. This makes it possible to implement a simple event listener/subscriber if you're more comfortable with this approach. All you need to do is to implement an event listener or subscriber and register it. This very simple example will just log the received signal.